The market for online mattresses is growing expansively. Dozens of different online companies now deliver quality mattresses straight to your doorstep. Many of these companies provide excellent products with reliable comfort. Today, we’ll be taking a look at the Saatva brand, the mattresses they carry, including Loom and Leaf and Zenhaven, and the materials they use. 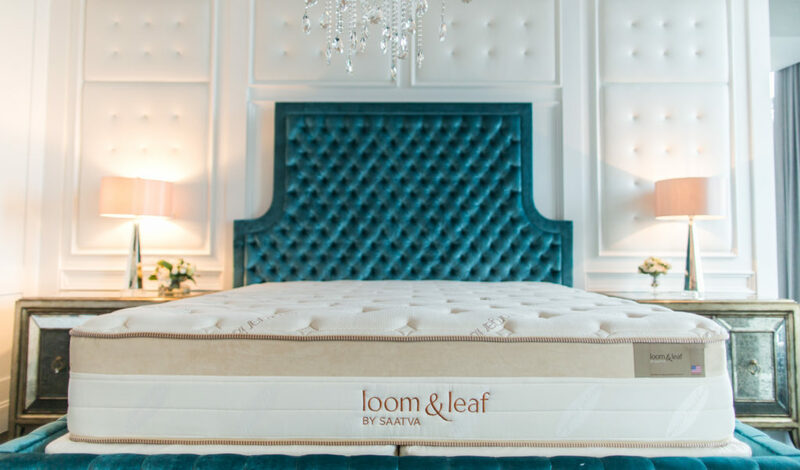 The Saatva brand was founded back in 2011 and sells three different luxury mattresses under three different brands: Saatva, Loom & Leaf, and Zenhaven. Chances are, you’ve heard of one of these three brands before reading this article as all of these mattresses are relatively popular. When Saatva first hit the market, they decided to sell their mattresses exclusively online. 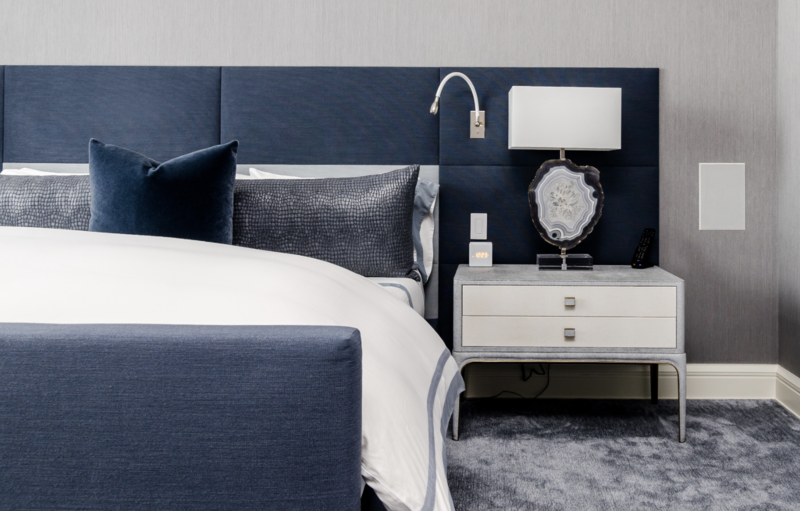 By deciding against opening brick and mortar stores, and choosing to sell online, Saatva is able to cut costs and sell their mattresses for lower cost. Additionally, by choosing to not sell their products in other mattress retailers, Saatva is able to have a more direct relationship with its customers and offer transparent information about their products. From the time their mattresses debuted, they were popular. By 2015, only four years after opening, they were ranked #101 on Inc’s Top 500 Retailers for the Year list and #68 on Forbes’ America’s Most Promising Companies list. Now, they’re regarded as one of the biggest and best online mattress companies in America. At first, they sold only their Saatva mattress, an innerspring mattress. After the success of their innerspring model, they decided to add an eco-friendly memory foam mattress to the list, the Loom & Leaf. Their expansion continued in 2016 when they released their all-natural latex bed, the Zenhaven. They specialize in creating eco-friendly beds, which makes them a popular choice for buyers specifically shopping for “green” products. They also make all of their products right here in the United States. In these next sections, we’ll be discussing each mattress and what they’re made from, as well as our recommendation as to who these mattresses are best suited for. The Saatva Mattress is the flagship model of the Saatva brand. It is an innerspring bed with a coil on coil design. Due to the use of two coil systems, this bed is more responsive to pressure and has a very bouncy feel. A big perk to innerspring beds is their breathability. Because there’s room in between the coils of the mattress, it allows for air to easily flow in and out of the bed. If you commonly find yourself waking up hot throughout the night, an innerspring bed may be a good solution for you. Traditionally, innerspring mattresses are not the best at isolating motion throughout the bed. Meaning, if you share the bed with someone who tosses and turns, you’ll be feeling most every movement on an innerspring bed. If motion isolation is valuable to you, an innerspring mattress is probably not a good choice. The Saatva bed is available as Plush Soft, Luxury Firm, and Firm. The cover of the Saatva mattress is made from 100% organic cotton, a soft and breathable material. In addition to using cotton, they also add a Euro-style pillowtop to the cover of their bed. Adding a pillowtop to an innerspring mattress is an easy way to soften up the feel of the bed. The first layer of the Saatva is convoluted poly-foam designed to provide pressure relief. Because the foam is convoluted, it enhances the bed’s breathability. Usually, a concern with poly-foam and memory foam is the chance of it trapping heat. Saatva addresses that concern and reduces the chance of the foam sleeping hot by incorporating this egg-crate designed layer. Below the foam is the first layer of coils. These coils are individually wrapped and designed to provide targeted support and pressure relief for the sleeper above. Usually, pocketed coils enhance the bed’s ability to isolate motion, and most beds using a pocketed coil system have moderate motion isolating abilities. However, because this bed uses two coil systems in the design, it lacks in its ability to isolate motion. The base of the mattress is a steel coil system encased in high-density poly-foam. Encasing the bottom coil layer in high-density poly-foam should improve the edge support of the bed. The core also provides durability for the entire bed and prolongs the bed’s lifespan. By using steel to make their coils, and then encasing those coils in durable foam, they’re reducing the chance of the bed sagging and losing its shape over time. The Loom & Leaf™, or L&L, is their all-foam mattress model. It’s made using state-of-the-art materials and is marketed as a luxury memory foam mattress for a competitive price. If you prefer a more cradling feel from your bed, a memory foam mattress is probably what you’re looking for. Memory foam is known for offering superb comfort and support because it has the ability to contour to your body’s curves, unlike other foams or innerspring beds. By contouring to your body, it relieves stress in your joints and pressure points while at the same time providing comfort. As we mentioned before, a concern with memory foam is the chance of the bed retaining heat and sleeping hot. To combat this concern, the Loom & Leaf™ mattress is designed with gel memory foam and other cooling technologies to prevent you from heating up at night. The Loom & Leaf™ mattress is available in Relaxed Firm and Firm. Traditionally, back and side sleepers are most comfortable on firm mattresses because they provide enough support to promote the spine’s natural alignment. That said, side sleepers typically fair well on softer mattresses because they allow the hips and shoulders to sink in enough to relieve pressure points. On their website, they advertise the Relaxed Firm model as their Best Seller, which we can assume means it’s their most comfortable model for the majority of sleepers. The cover of the L&L mattress is organic cotton and flame-retardant thistle. Using cotton in the cover gives it a soft feel, while the thistle acts as a natural flame-retardant and feels cool to the touch. They use a thin layer of foam in their cover to enhance the bed’s pressure relieving abilities. The first layer of this mattress is gel-swirled memory foam. By incorporating cooling gel into their memory foam, they reduce the chances of their bed sleeping hot. This layer is slower to respond to pressure, meaning it should conform to your body and provide comfort. Additionally, they added an extra layer of gel on the lumbar region of the bed. In addition to keeping you cool, gel is also thought to enhance the firmness of the bed in the specific areas it is infused. By increasing the firmness of the lumbar region of the mattress, they’re also improving the support the mattress offers to your spine. Below the first layer of memory foam is another layer of high-density memory foam. While the first layer functions to provide comfort and keep you cool, the second foam layer is designed to contour to the curves of your body. This layer is specifically designed to offer pressure relief. Next, comes a transition layer of poly-foam. The transition layer acts as a barrier between the soft memory foam layers above and the dense foam core below. 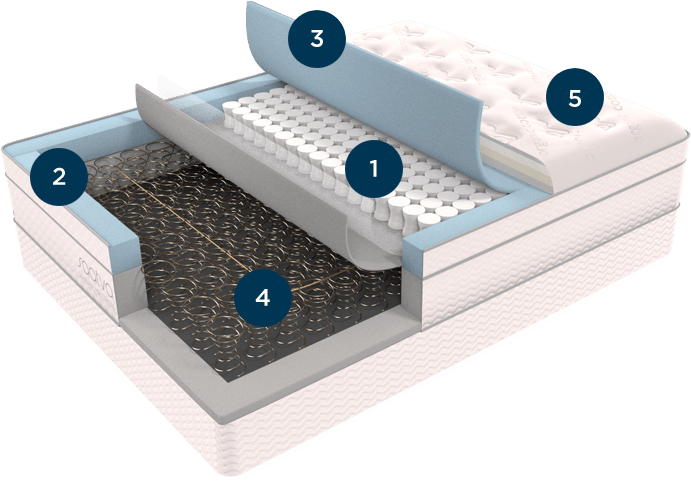 By including a transition layer in the design of their mattress, it reduces the chance of you sinking straight through the first soft layers and bottoming out on the firm core layer. The foundation of this mattress is a layer of high-density poly-foam. It’s crucial the core of the mattress is durable as it functions to provide stability to the mattress layers and sleeper above. By using high-density foam, it makes the bed more durable and can prolong the bed’s lifespan. The Zenhaven mattress is Saatva’s all natural latex model, made from 100% pure Talalay latex. Their latex bed is designed to offer exceptional support and promote your spine’s natural alignment. Additionally, their all natural latex is seven times more breathable than other types of synthetic latex. Meaning, the Zenhaven should offer a cool and breathable sleep surface. As we mentioned before, Saatva makes all of their mattresses right here in the United States. When it comes to their Zenhaven bed, they also source all of their latex from the United States, too. The health benefits of choosing a latex mattress are extensive, but some of the biggest reasons people prefer latex are because it’s all natural, eco-friendly; hypoallergenic; and resistant to mold, mildew, dust mites, and other germs. It’s also free from harmful chemicals and volatile organic compounds, commonly found in other types of beds. Unlike memory foam which contours to your body, latex is more responsive and offers a bouncier feel. Instead of sinking down, a good-quality latex mattress should lift you up and offer pressure-free support. If you commonly experience aches and pains upon waking up in the morning, a latex mattress may be a good option for you. The Zenhaven Latex mattress is a bit different than other all-natural latex mattresses in the fact that it has flippable firmness. Meaning, one side of the mattress is a certain firmness and the other side is a different firmness. Flippable firmness allows you to sleep on both sides of the mattress to decide which firmness is most comfortable to you. In the mattresses above, you’ll notice the core (or foundation) layers are the last layers of the mattress. In the Zenhaven, the core of the mattress is actually the center of the bed. On either side of the core is a layer of latex, one layer soft, the other firm. The cover of the Zenhaven mattress is a combination of organic cotton quilted and 100% organic New Zealand wool. Cotton is soft to the touch while the wool offers a cozy feel. The first layer of the mattress is soft and supportive Talalay latex, called the Luxury Plush layer. Talalay latex specifically is known for being soft to the touch, but supportive enough to offer a more “on the bed” feel. Meaning, when you sleep on the Zenhaven, you will feel lifted instead of cradled. The next two layers of this bed are the same and they work together to provide a dense, supportive core of the mattress. Each of these layers is denser Talalay latex. Because this latex is denser than the plush latex used above, it offers more bounce and support. The final layer of the Zenhaven mattress is a gentle firm layer of Talalay latex, called the Gentle Firm layer. The Gentle Firm side of the bed offers more lumbar support than the Luxury Plush side of the bed but is not as pressure relieving as the softer side. The Luxury Plush side of the Zenhaven is ranked a 6 out of 10, or medium-firm, in regards to firmness while the Gentle Firm size is ranked a 7.5 out of 10. For this article, we’ll be basing all of our prices on Queen sizes. The price of a Saatva mattress is $1,099. The Loom & Leaf™ costs $1,299. A Zenhaven mattress is $1,899. All of these mattresses come with free White Glove Delivery and free removal of your old mattress, too— a big perk to buying with Saatva. The Saatva brand offers a 120-night sleep trial with all of their mattresses; this gives you a few months to test the mattress out and decide if it’s the best bed for you. If you decide against keeping your new mattress, Saatva will arrange for it to be picked up and refund you in full. The only fee associated with the refund is a $99 transportation fee. The warranty for these mattresses varies. The Saatva mattress and Loom & Leaf™ are both protected by a 15-year warranty, while the Zenhaven comes with a better warranty of 20-years. Though these warranties differ in their duration, they’re pretty much exactly the same. They both protect against defects in the workmanship or materials of the mattress. They do not disclose exactly what qualifies as a defect, so before you buy, ask more questions about their warranty. For the first two years of your warranty, The Saatva Company will replace your mattress at no charge to you if it’s deemed defective. After year two, The Saatva Company will repair and re-cover your mattress if it’s found to have a defect. There are no additional costs to have them repair your mattress, however, you would be responsible for the $99 transportation fee to ship the mattress back to them. Saatva also offers an alternative warranty program called their “Fairness Replacement Option.” If your mattress is deemed defective, you have the option to opt into this program. The Saatva Company started offering this program because they found there were many disputes between their brand and customers when determining defects and which areas of the mattresses needed to be repaired. If you opt into this program after your mattress is deemed defective, you get to keep your original mattress, and Saatva will issue you a replacement at a discount. The size of the discount depends on how far you are in your warranty. In years 3-5 of the “Fairness Replacement Option,” The Saatva Company will deliver and install a new mattress for you at a 70% discount. In years 6-10, The Saatva Company will deliver and install a new mattress at 50% off. In the last 10 years of the warranty program, The Saatva Company will deliver and install a new mattress at 25% off. All in all, The Saatva Company receives great customer reviews; not only for their quality mattresses but for their responsive and helpful customer service team. They aim to sell high-end luxury mattresses at a budget-friendly price. Regardless of your mattress preferences, The Saatva Company seems to have an option for everyone. If you prefer a responsive, bouncy feel from your bed, the Saatva mattress is perfect for you. If you’re looking for an all natural bed, their latex model is probably best for you. Lastly, if you prefer a more cradled “in the bed” feel from your mattress, the Loom & Leaf™ is a great option. If you’re not sure The Saatva Company carries a mattress to meet your sleep needs, read out other mattress reviews to find the best bed for yourself.